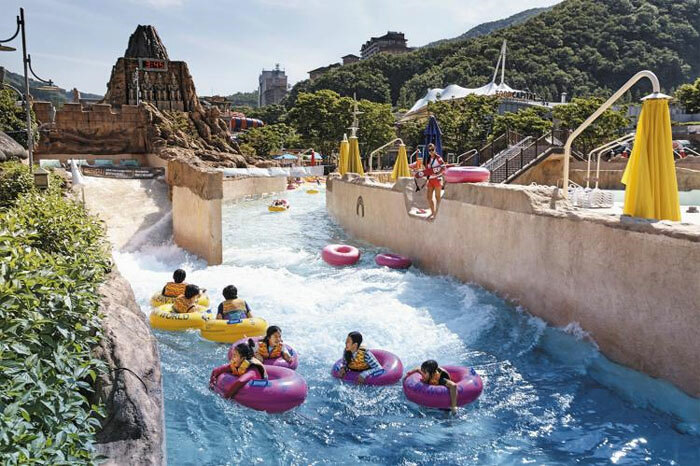 Korea's big four water parks are fizzing with chlorine, falling way short of international standards. A total of 36 complaints were lodged with the Korea Consumer Agency over the past three years, most of them about skin problems like inflammation and rashes. The amount of combined residual chlorine found at Caribbean Bay, Lotte Water Park, Ocean World, and Woongjin Playdoci exceeds World Health Organization standards of less than 0.2 mg per liter of water, according to the KCA on Wednesday. Combined residual chlorine was particularly high at Lotte Water Park (0.64 mg/liter) and Caribbean Bay (0.56 mg/liter). Combined residual chlorine forms when chlorine reacts with sweat and urine in the water. It can cause stinging eyes and skin problems. The level goes up if the water in a pool is not changed often enough or there are too many swimmers in the pool. All four water parks met the domestic standards for water quality, which do not include combined residual chlorine levels. Lotte Water Park has higher levels of free residual chlorine and potassium permanganate than the others. The water quality was best at Ocean World in Hongcheon, Gangwon Province. No colon bacillus was detected in any of them.